In sweeping the San Jose Jr. Sharks in their best-of-three series, the Los Angeles Jr. Kings’ 16U AAA team celebrated the title in its division at this year's CAHA State Championships, which were contested at Irvine’s Great Park Ice & FivePoint Arena. The Los Angeles Jr. Kings’ 16U AAA team celebrated the title in its division at this year's California Amateur Hockey Association (CAHA) State Championships, which were contested at Irvine’s Great Park Ice & FivePoint Arena. The Jeff Turcotte-led squad doubled-up the San Jose Jr. Sharks, 4-2, in Saturday’s finale punching its ticket to next month's USA Hockey Pacific District Championships. In the victory, forward Danny Minnehan struck for a pair of goals and an assist with forwards Ean Somoza and Nate Seekins picking up the other Jr. Kings markers. Between the pipes, goaltender Alex Bonrouhi turned aside 20 shots. The 16s opened its state tournament on Friday with a 5-3 victory over the Jr. Sharks in their best-of-three series. In that game, Minnehan potted a pair of goals and forward Max Nguyen tallied a goal and an assist. Defensemen Spencer Shugrue and Bryan McLachlan connected for the other Jr. Kings tallies, while Bonrouhi made 32 saves. "It was a great effort all around, and that's what you need to succeed on weekends like this when there's so much on the line," said Turcotte. "Both games were tightly-contested and I'm extremely proud of how our boys pulled together. "Our next task is preparing for districts, which we know will be a challenge but no doubt ready." And despite losing the finales in their respective divisions at this year’s CAHA State Championships, both the Jr. Kings’ 15U AAA and 14U AAA teams also earned berths to the Pacific District Championships. The 16U AAA and 15U AAA Pacific Districts will run from March 7-10 at Great Park; the 14U AAA the same weekend in Las Vegas. 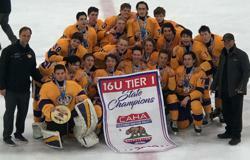 The Jr. Kings’ 13U, 12U and 11U teams will compete for CAHA state titles the weekend of March 1-3 at Great Park.